"The artist, who is a full Academician of the Royal Hibernian Academy of Arts and a resident of Dublin, is a well-known exhibitor at the London Royal Academy, the New Gallery, and the numerous minor English exhibitions. In this careful and well-painted study of the shores of a little tidal river, its smacks, its boats and part of its population, he evicnes many of the qualities of the newer English school of painting in which the absence of literary and sentimental attributes is more than atoned for by close observance of nature and faithful rendering. 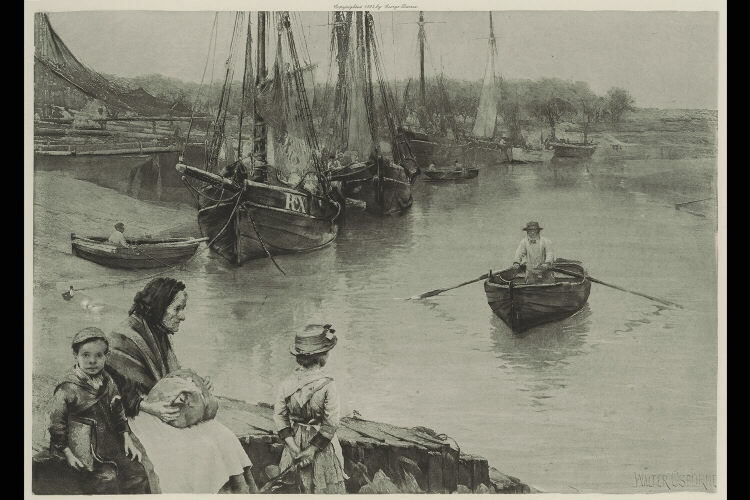 It is apparently low tide at this small port, much of its fleet is temporarily aground, and one of the families is awaiting in the foreground the leisurly approach of the ferryman. ".